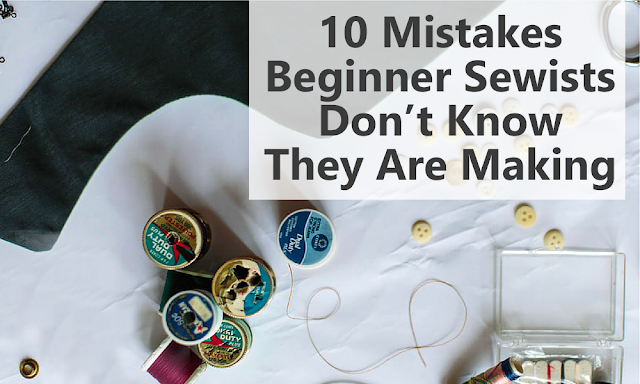 OK, honestly, this isn’t really just for beginners. I am super guilty of a lead foot. But the faster you sew, often times the wonkier your seams are. And no one likes crooked topstitching. Did you know there are speciality feet that will help you get near perfect edge stitching? No? How about one that will make installing a concealed zipper a breeze? How about a foot that will do a beautiful rolled hem on your sewing machine? Or a walking foot that will make sewing with knits so much easier? Specialty feet can positively impact the quality of your finished product. I am a little addicted to presser feet to be honest. I’ve found great luck with buying them off MySewingMall. As I mention in my 15 Bad Sewing Habits post, It is often recommended that your needle should be replaced after every project. Now I don’t usually replace until every 3 or 4 project, but a lot of people don’t even replace that often. A bad needle can cause lots of sewing stress. If I’m having a tension issue, its often because my needle needs to be replaced. I’m not talking about when you are personally trying to hack a pattern. I know, this is another one of those pattern designer rants, but hear me out for a second. Sometimes, even when the instructions seem off, there is a methods to our madness. I’ve helped customers out that have had problems with their projects that could have easily been solved if they just followed the directions. While a beginner might think things like basting and stay stitching seem pointless, they are important for a quality, well finished garment. This seems contradictory after my last point. I’m not talking about growth here. I’m talking about trying to do something so advanced that the average seamstress would run in fear. I see in sewing groups sometimes new seamstresses that have never sewn a garment before wanting to make a wedding dress which is often 7+ layers of fabric and using high-end couture sewing techniques. Know your limits. Nothing will make you feel frustrated more than a project that is far more advanced than your current skill set. And you never know, one day you might make sewing couture gowns look easy. This is the biggest mistake I see seamstresses make. Nothing can make your garment look more homemade (and not in a good way) than not ironing. In truth, you should be at the ironing station longer than you are at the sewing machine. Iron your fabric and every seam, and you will see a huge difference in your finished project.